Thanks to the amazing Alexandra at Bride’s Head Revisited for her suggestions on pairing these lovely veils and combs with some of our most coveted gowns. Stop into Blue during the month of March to see these amazing 2011 designs for yourself! Any orders placed during the month of March will receive 10% off this chic designer, exclusive to Blue! Enjoy! 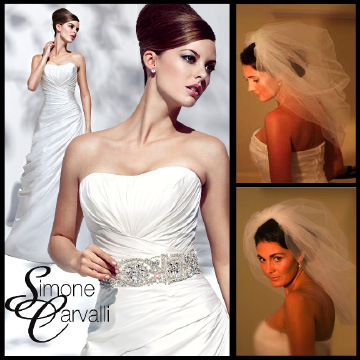 For this Simone Carvalli gown, the “Heather” veil, a wonderful “bubble” veil would complement the fashionable cut of the gown and give it a stylish edge. For extra sparkle to match the belt, the Heather veil sprinkled with tiny Swarovski crystals would be a fun and elegant addition to the look. This romantic look by Tara Keely calls for a chapel length veil, like the “Emma” that will float around the bride like a cloud. 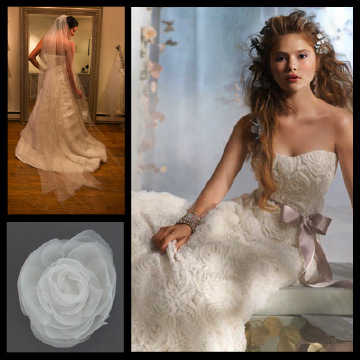 A beautiful lush flower in the bride’s hair like our silk net and chiffon cabbage rose, would be the perfect accessory to complete the soft romantic look. For this La Sposa gown, our popular “Elinor” veil would enhance the lovely mermaid shape of the gown. 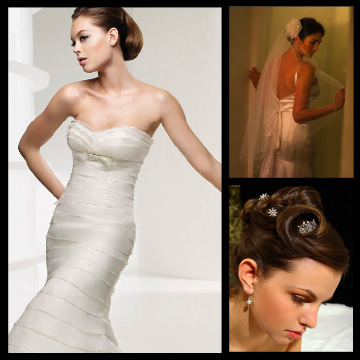 It’s a fingertip length veil that is cut shorter in the front so that it frames the body nicely. It’s also a very sheer veil that won’t weigh down the lightness of the organza layers on the gown. An elegant comb like the #503 tucked into the side of the head would add some stylish sparkle to the look.